"Bullies begins with bikers and beat-downs, but quickly becomes something bigger: a portrait of a group of men, in America's most radical city, that is at once honest, soulful, original, brutal, and just plain beautiful." 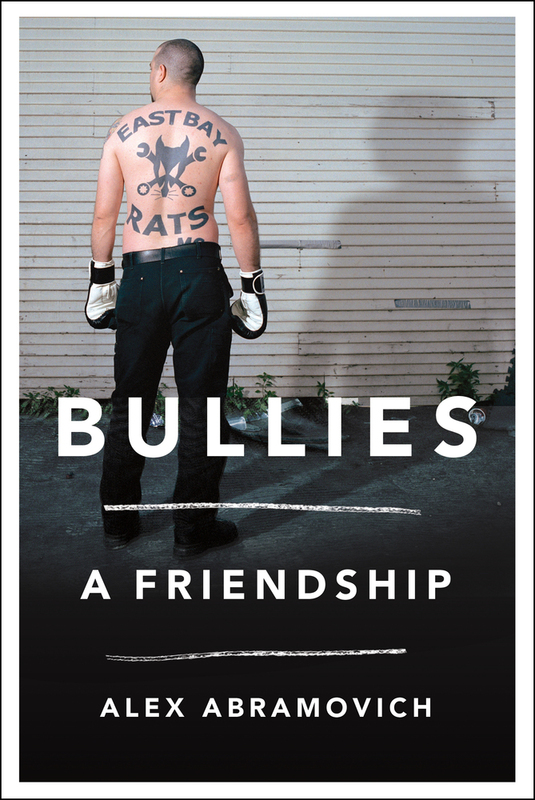 "Alex Abramovich's Bullies, a great book about the prickly subject of masculinity, is also a woozy parable about America today. Which is to say that it's about coming to terms with flaws and failures and watching as the ground—Oakland, in this case—shifts under your feet. It's clear-eyed, unlyrically lyrical, and never shies from the truth." "Bullies is many things at once...in format, Bullies feels to me...like a series of linked vignettes, in the mold of Joan Didion’s “The White Album”...what the book makes clear is that violence begets violence: Just as Abramovich and Latham were products of broken, unhappy childhoods, the East Bay Rats, in their embrace of systematic violence, are the product of a place where systematic violence has long been a way of life." “Abramovich’s narrative persona is artfully restrained.... He has in common with Geoff Dyer — another writer expert at mixing memoir, history, reportage, and cultural criticism — an impeccable instinct for his best material." "Thought-provoking and fearless, Bullies offers sharp insight into violence, masculinity, and the history and future of one of America’s most dangerous cities." "A tragicomic exploration of male violence and bonding...Abramovich’s sharp-eyed, entertaining reportage unfolds like a mash-up of The Wild One, Fight Club, and Jackass; his examination of the Rats’ worldview is sympathetic and nuanced, but squarely faces the group’s dysfunctions and the troubling questions they raise about American society." "Thoughtful and engaging...A sharp, provocative memoir of an unlikely friendship." “Alex Abramovich's Bullies: A Friendship begins as memoir but ends as witness testimony to an era in American history…Bullies is the story of two men's journey to put the demons of their childhood to rest. Along the way, it also manages to become a portrait of a city and a country locked in a struggle with some of those same demons." Alex Abramovich writes for the London Review of Books and teaches at Columbia University. He lives in New York City.